During the holidays, camel costumes pop up in Christmas plays and Nativity scenes. Other times of the year, camel costumes can still be great fun. Imagine trotting in as a camel at an exotic party in Las Vegas or Palm Springs, or some other desert oasis. Whatever the occasion, you can make a quick camel costume with some basic materials and sewing skills. Cut out two large circles of brown felt. Pin them on the backside of the tan jumpsuit so that they resemble two symmetrical humps. Sew the materials together along the outline of each circle, but leave an opening at the top of each. Through the opening, stuff each hump with fiber fill. Adjust for desired size and firmness. Sew the opening of each circle shut to seal the felt to the jumpsuit. Before this final sew, however, you may want to try the suit on to make sure the stuffed humps are not too unwieldy. Sew the tan hood to the collar of the jumpsuit. Gather the fabric at the top rim of the hood into a single pleat and sew the folds together. This will be the camel’s nose. Add two nostrils with a black permanent marker. The hood should now be somewhat pointed like a camel’s snout. In a similar fashion, twist and sew two small pleats on the outer crown of the hood. These will be the camel’s ears. Cut out a strip of pink felt and sew it underneath the nose, allowing it to protrude from the hood. This will be the camel’s tongue. Add one wiggly eye to each side of the hood. The eyes should be placed higher than the nose but lower than the ears. You may need some extra glue if the peel-and-stick adhesive doesn’t hold to the fabric of the hood. For a two-person camel costume, you’ll need two tan jumpsuits, a camel’s head, but no felt humps. Rather, use a sheet of tan fabric to connect both people. 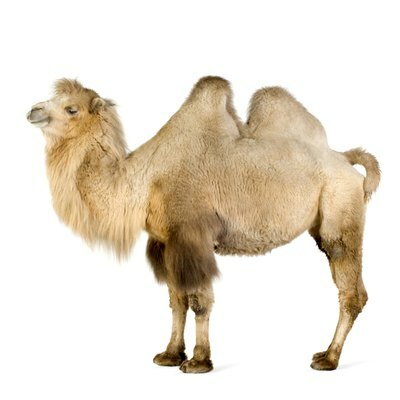 The front person will boast the camel’s head, and the actual head of the rear person beneath the sheet will become the main hump.